Is fashion art? Does it fall under the same umbrella as a painting, a sculpture and a graphic novel? Or does it stand alone as a form of creativity. In the new spring and summer collections we have seen more and more designers combining their love of artwork with their passion for fashion. And when the lines between art and fashion are blurred a beautiful love child is created. Take Alice Temperley’s new spring/summer collection, which From The Streets recently visited at their store in Mayfair. The collection was inspired by the sunny French Riviera, with many aspects of the landscape being drawn into the collections design. At first glance it’s easy to miss the intricate details, like the embroidery that adorns many of the dresses in the collection. Drawn in the style a child might draw a bird’s eye view of a landscape, the lollipop trees and complex topiary mazes create an intricate web across the collection. Each of the designs could either serve as a map for an adventure on a sunny day or be framed and put on the wall of a gallery. 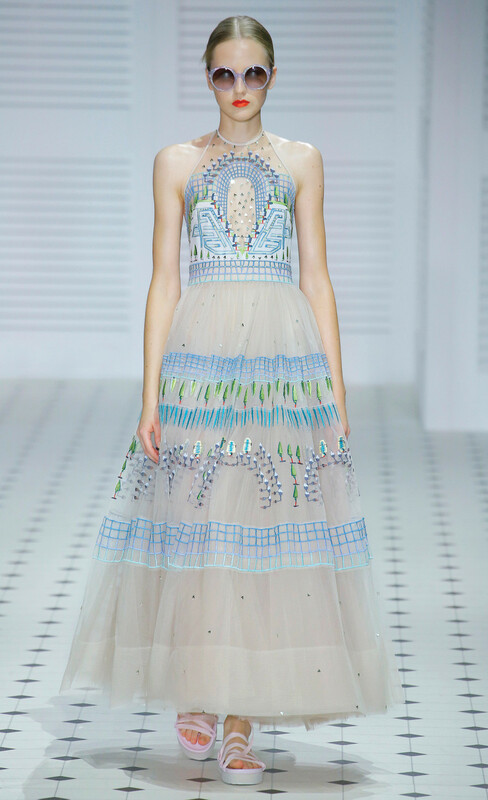 To contrast the fine embroidery, several of the dresses and cover ups have been created with what looks like a watercolour painting turned to silk. Bold images of cacti’s and Mediterranean like leaves are interweaved to create a crazy pattern, illuminated in bright pinks and oranges. These designs started out on paper as an analogue piece of artwork and then were digitalized and recreated on fabric. Is the dress still a piece of art? Or did it transcend that when put on a model? A model who is probably lounging by a pool and drinking martini’s. These flower prints combined with polka dots and candy pin stripes have been layered on to floor length cardigans, sundresses and jumpsuits. Combined with cinched belts and 1950’s style cuts that end just above the ankle; give the collection a young and feminine feel. In comparison the evening gowns sparkle with deep blues, black and gold. The plunging necklines and head to toe iridescent sequins show how the girly dresses become seductive as the sun goes down. But even these dresses have secret illustrations, with the adornments on one dark blue dress showing a diamond garden patterned over the bodice. 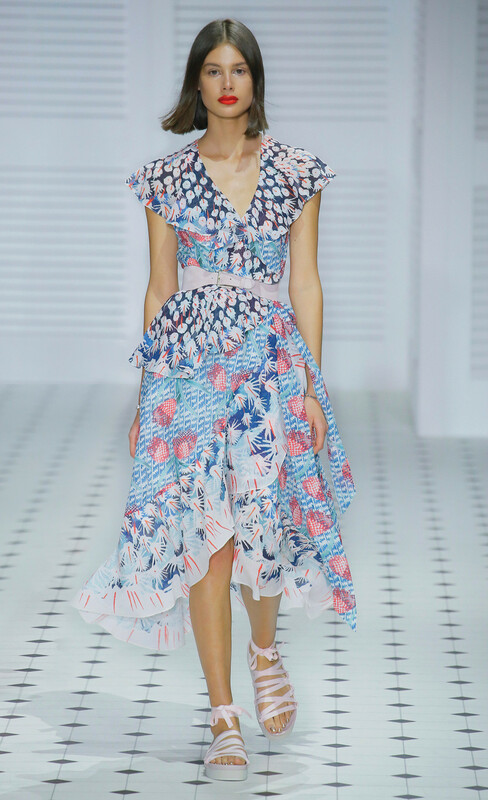 It’s not just Temperley’s collection that has incorporated the use of artwork into their designs for the upcoming season. The family based lounge wear company; Derek Rose have used beautifully intricate paintings, inspired by India, as the base for several of their spring/summer pieces. When there is an input of extensive effort into the creation of designs such as these two examples, it feels embarrassing to call them anything less.